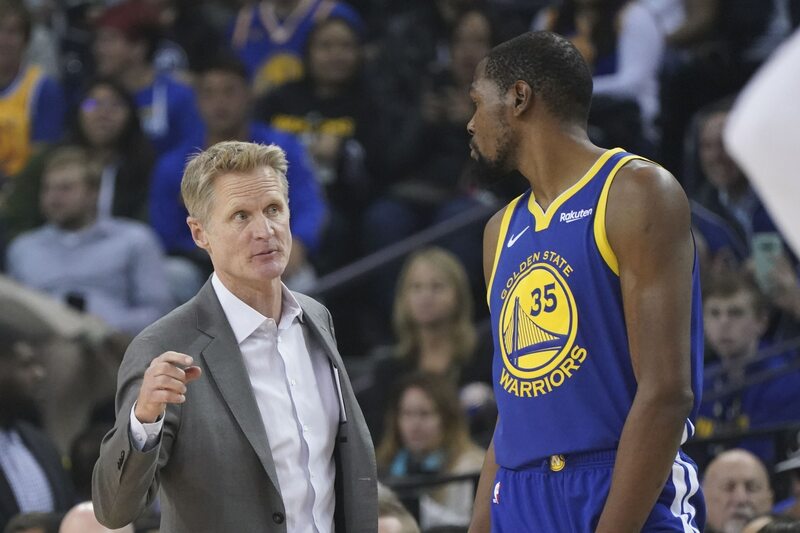 The Golden State Warriors should have at least been in a celebratory mood after a 39-point win over a shorthanded San Antonio Spurs team at home on Wednesday evening. Instead, it was two-time reigning NBA Finals MVP Kevin Durant who made all the headlines. In his first meet-and-greet with the Bay Area media in over a week following the game, Durant put said media on absolute blast — calling out one reporter in particular. At issue here are the never-ending questions about Durant’s impending free agency. It’s something that has surrounded the Warriors in recent months. But it’s also something Durant — fair or not — doesn’t want to discuss. In talking about the Durant situation, Warriors head coach Steve Kerr put this interesting spin on it. Some may conclude that Kerr calling it a soap opera is a shot at Durant. Though, it’s more likely he’s shading the local media. Whether Kerr, Durant and the rest of the Warriors like it or not, this is going to be a continual narrative hanging around the team’s neck all the way up until July. Durant might have a thin skin when it comes to all of this. Hopefully for the Warriors’ sake, the rest of the team takes Mr. Kerr’s approach.